"It was stupid for them to be fighting about this. A rational part of her mind knew this. She knew that Ed didn't really blame Jane. She knew her husband was actually a better, nicer person than she was, and yet she couldn't forgive him for that 'silly girl' comment. It somehow represented a terrible wrong. As a woman, Madeline was obliged to be angry at Ed on Jane's behalf, and for every other 'silly girl', and for herself, because after all, it could have happened to her too, and even a soft little word like 'silly' felt like a slap." I'm a lobbyist, and my sister is a nurse. We're both "high achievers", so to speak. Part of that is because of who we are, but part of that is because my mom pushed both of us to be academically successful too. On the one hand, she wanted us to always be able to support ourselves...being able to take care of not only herself but two little girls enabled her to escape a bad marriage. On the other hand, she was one of very few single mothers in the small town I grew up in and she didn't want to have to face the patronizing pity of the stay-at-home moms who would have judged her for it if we turned out anything less than model students. Mommy wars are hardly anything new, of course. They've probably been going on as long as there have been moms (i.e. forever). 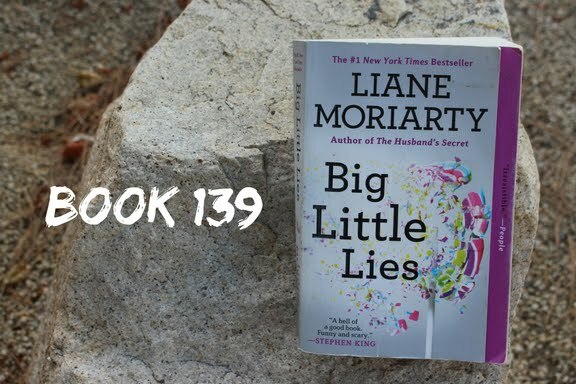 Liane Moriarty's Big Little Lies has its roots in drama between mothers, but there's a bigger story here. It begins on the first day of kindergarten in a small seaside Australian town, drawing together a group of women who all have children starting school that day: hotheaded Madeline, her ex-husband's serene yoga instructor wife Bonnie, her beautiful best friend Celeste, and the new arrival in town, young and insecure single mother Jane. Of these women, only Madeline is much like she seems to be on the surface. It seems frothy, this story about the bonds between women, and in some ways it is, but there's a lot of darkness behind the surface veneer of fun. I hope enough people have seen the HBO show or read the book by now that this won't be considered much of a spoiler, but lovely Celeste with her perfect life and doting husband is hiding years of domestic abuse, Jane's sweet little boy is the product of a one-night stand with a sadistic jerk, and Bonnie's secrets are too much a part of the suspense to give away. All we know when we begin the book is that there was a death a school function, and interviews with the police frame the chapters, dropping little hints about what might have happened and to whom. I'll be honest...this is a genre of book that I tend to see on airport bookstore shelves and walk right past. But Big Little Lies is a great example of why it's often a fruitful exercise to get outside my comfort zone every once in a while. I found the story of the relationships that grew (and frayed, sometimes) between the women to be well-told and emotionally resonant, which meant that by the time all is revealed at the end, the payoff was earned and carried weight. The mystery of what happened keeps the plot moving forward through character-building beats, resulting in a book that's well-balanced between the story and the people who populate it (in other words, both plot and character lovers will find something to enjoy here). After I finished this book, I found myself wondering why domestic drama stories are so often relegated to the pile of "chick lit" and treated as insubstantial. A book like Jonathan Franzen's The Corrections is entirely the story of a family and their relationships, but it's treated as Serious Literature while something like Big Little Lies, which actually wrestles with weightier topics, is considered to be Women's Literature, For Women Only. There's still a great deal of institutional bias against books written by women about women: Liane Moriarty is very successful, but her work is treated as niche interest instead of relevant to everyone. If stories about men engaging in self-discovery, exploring the world around them and finding their places in it are marketed widely, why shouldn't stories about women doing the same be given the same treatment? Tell me, blog friends...do you turn up your nose a bit at "women's books"? I hadn't really considered it before, but I think you are correct about "women's books." I know I avoid books about romance like the plague, without further investigation. There have to be some goods ones out there. I'm the same way. A cover looks a certain way, and I don't even look inside the pages. I certainly wouldn't have grabbed this one if not for the show getting so much praise! We showed them! Love you too Mumu! I really enjoyed this book. I found the twist at the end interesting. I like the series just as well as the book. I think I'm holding off on starting it because I'm sure I'll get sucked in and I don't want to lose a whole weekend to binge-watching but I need to just make myself sit down and watch it! Big Little Lies was never on my TBR until the miniseries premiered and got such high reviews. To be honest, I haven't heard one bad word about it! I finally started watching the series this weekend and it's living up to the book for me...both are so good!